This card could easily be used for Christmas or any other celebration. I made this one for the QVC show in July 2013, for Sue and Harvey of Imagination Crafts. There are just so...many people out there who just love cats, so I hope you like my card. 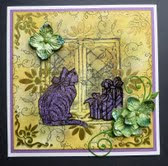 Make a base card from mauve cardstock. Take a piece of white card slightly smaller than the mauve and colour it with distress inks. Stamp the cat in the centre using a grey inkpad or an old black inkpad which does not have much ink left in it. Stamp the scroll stamp around the edges, again using the grey pad. Lay the Fleur-de-lis stencil on top and blend green distress ink through the stencil. Using the Versamark pad, some cut n' dry foam, lay the stencil on the card, setting it slightly to one side of the first stencil image you did with the green ink, then dab the Versamark through the design on the stencil. Remove stencil and heat emboss using gold powder. Stamp the cat and presents only using a black Stazon pad onto a piece of acetate. Cover the reverse of the image with lavender sparkle medium. 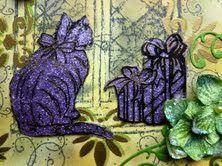 When dry, cut out the cat and presents only and glue onto the original stamped image on the centre of the card. Add some green flowers and die - cut stems. Colour the windows with a grey Promarker pen so it looks like dusk outside. Well that is it finished friends. I'll be back again soon with yet another card for you. 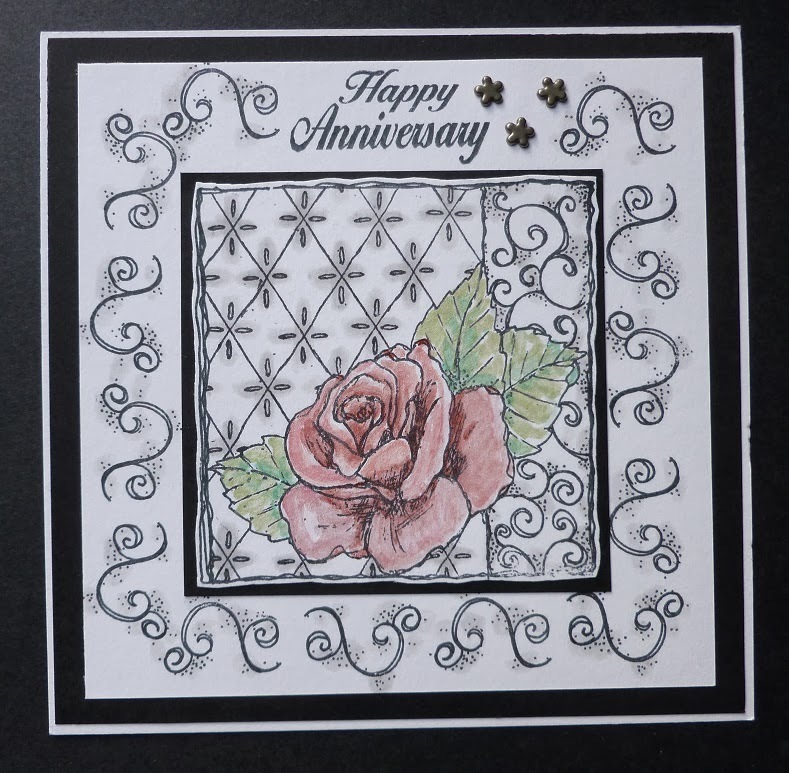 I thought today I would show you a card I made for Sue and Harvey of Imagination Crafts, in May of 2012 using their lovely Rose Stamp from the Summer Decoupage Set, and coloured with their Nature Set of Mica Powders, I think these are my most favourite colours of all the mica powder sets. Ok enough of my chit chat, let's get started on this card. Make a white base card. Onto this matt some black card slightly smaller than the white. Take a piece of white card approx. a quarter of an inch smaller than the black card and stamp the 'Happy Anniversary' from the set, at the centre top, using black ink. Stamp the swirl stamp, also from the set, around all four edges of the card. Punch three small holes at the top and insert three brads. Fix this to the base card. 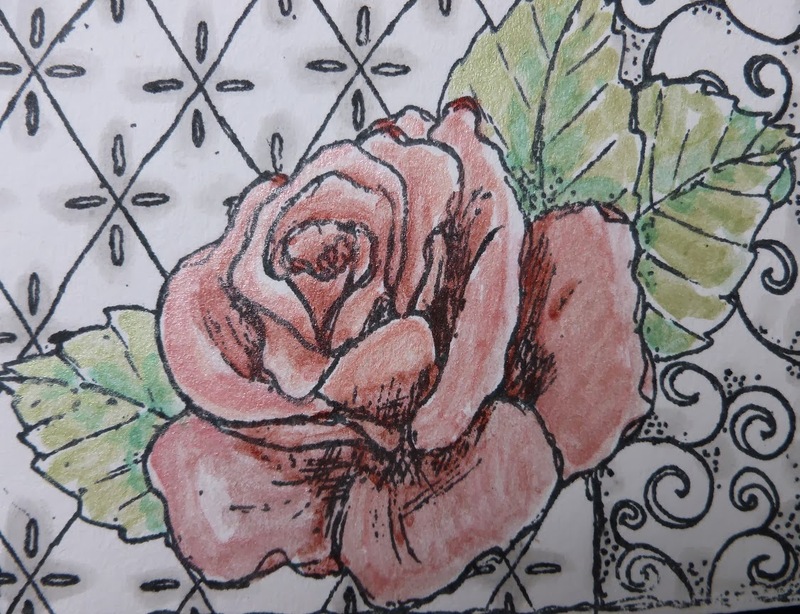 Take a further piece of white card and stamp the rose image onto it using a black inkpad. Cut out the design and paint it using the mica powders mixed with a little water and a paintbrush. Colour in the shaded areas of the design with a grey Promarker pen. Fix this to some black card and trim leaving a small border showing. Fix this to the centre of the base card. Well that's it finished. 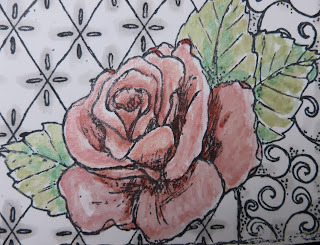 Although this is a decoupage stamp set, it still looks good when only one layer is used. Unfortunately the beautiful sheen of the pink mica rose does not show up very well on the photograph. Take care until next time. I'll be back soon, hope to see you back too lols. Hope you are all well and happy, if not I'm sending out a hug to those who may need one - did you feel that hug ? good lols. Well today's card that I would like to share with you is one I made in June of 2012 for Sue and Harvey of Imagination Crafts I'm now back in the Christmas mode lols !! So here goes, this card is quite a quick card to do but not if you are making a batch of cards ! The base card is made from dark green card. Cut a smaller piece of white paper and paint all four edges with gold mica powder mixed with water. When dry, matt this onto the green card. Take another piece of green card a little smaller than the gold edged paper and punch all four corners with the corner punch. Put this aside for the moment. Put a piece of white card and the poinsettia stencil and put through an embossing machine. 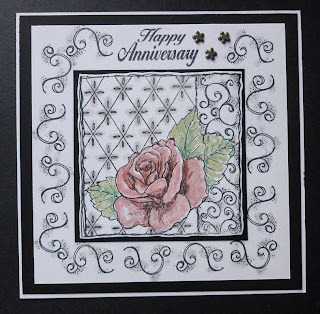 Gently rub the Versamark pad over the embossed card and brush the mica powder over it. Remove the excess powder. Randomly stamp the holly with black ink (second stamping !) as we don't want the holly to stand out too much. 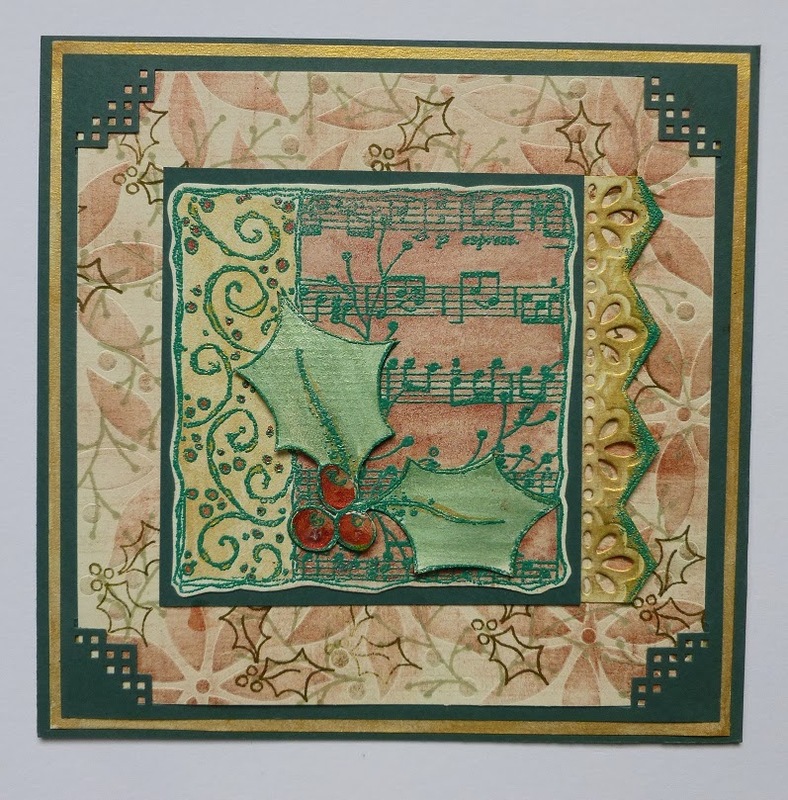 Do the same with the mistletoe sprig but this time use the green distress ink. Fix this panel into the four punched corners you did earlier. Stamp the main image onto some white card using Versamark and heat emboss using green embossing powder. Colour with mica powders, brush and water. Cut out and matt onto a piece of green card, slightly larger than the image. Fix this to the base card. Stamp out the holly, only this time, cut out, colour and 3D onto the original image. Cover the red berries with Magi - Glaze. 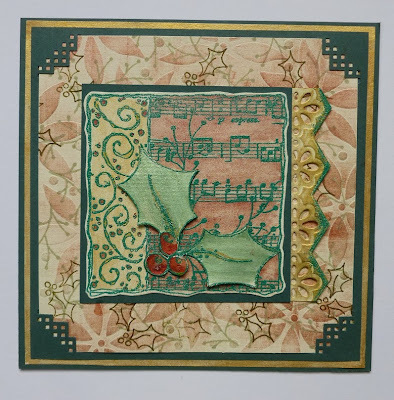 Use the Edgeabilities dies and a die - cutting machine and cut out and emboss a border. Paint it with gold mica powder. Rub the Versamark pad down the outer edge of the cut strip and heat emboss with green powder. Glue this to the right - hand edge of the central image. Well that's it folks, not too much work but more a one off lols. Hope you like it. Thank you so...much for visiting our blog. We look forward to hearing your comments. Until next time, take good care of yourselves.